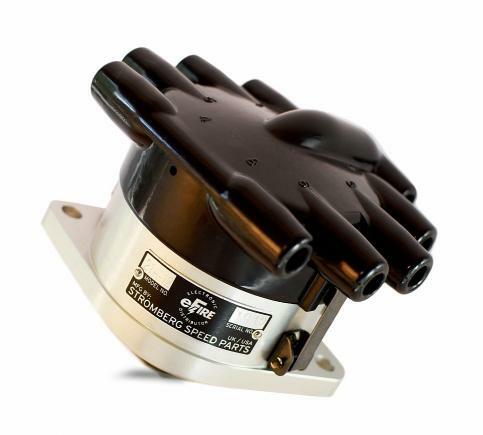 NEW FROM STROMBERG for your flathead Ford. The e-FIRE distributor, with electronic ignition, traditional looks, easy installation and simple set-up. Every e-FIRE distributor looks like it belongs on your traditional flathead motor, with a regular black cap and an old-school performance tag. It’s also as short as we could make it, which is important if you’re building a hot rod. Every one has electronic ignition. No points, no condenser, no black (or red) box and very little maintenance. Just higher efficiency, economy and accurate spark timing. It’s easy to install, with just two wires to a regular coil, and adjusts just like a stocker with the static timing screw on the side so you don’t have to unbolt it and turn the whole body. 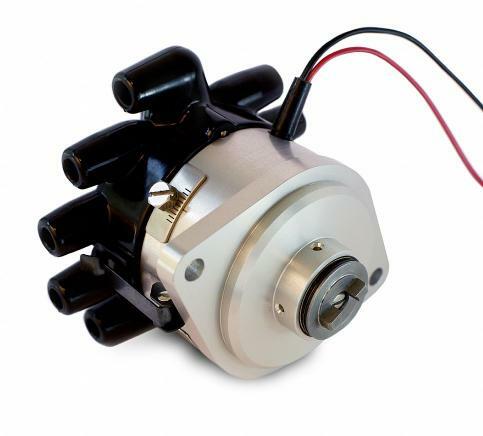 The advance rate (and max total advance) is tuned specifically to suit the flathead V8 motor and every e-FIRE distributor is machine tested and ready to run. Must be used with a points style coil only, with a resistance of at least 3.0 Ohms (Ω) or 1.5 Ohms with a ballast resistor. DO NOT use a low-resistance or HEI-style coil.